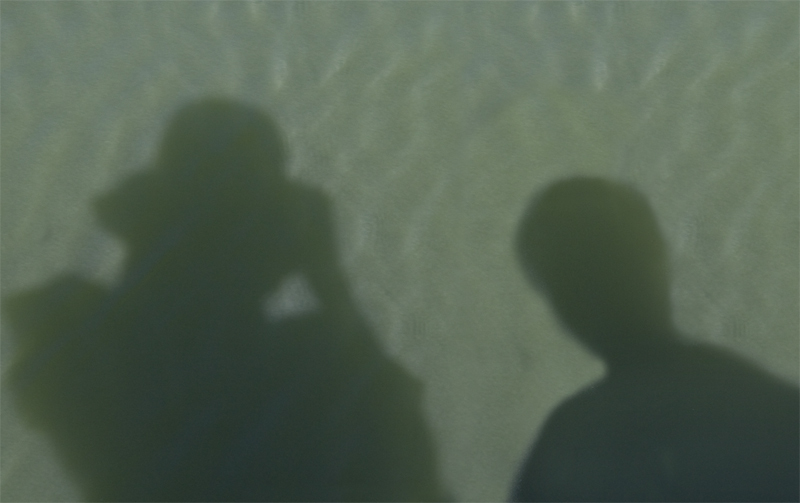 BEN AND YEUNG HAVE SET THE DATE! Because this is the week you turn into a five year old, I thought I would send you a picture of a different insect every day for five days. 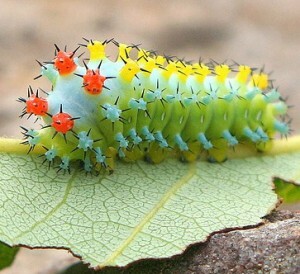 Here are two pictures of a very hungry caterpillar. What does it eat? 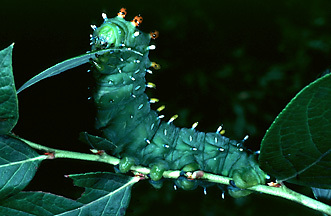 This caterpillar will grow until it is almost 5 inches long. It will need to eat a lot! Why do you think it has those funny different colored bumps on its head and back? 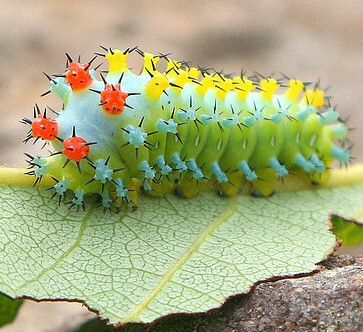 This is a Cecropia moth caterpillar. It will spin a big cocoon when it has finished growing, attach the cocoon to a plant and hide there all winter, even in the ice and snow. When it warms up in spring, what do you think will happen? 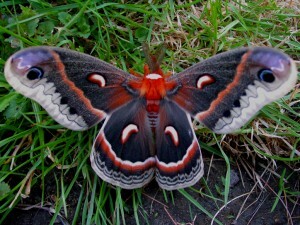 Here is a picture of the Cecropia moth that beautiful big caterpillar turns into. The word for that process-when one body changes into another different body is called metamorphosis. That word is almost as big as the moth! This moth is the biggest moth in the United States where we live. It is so big (5 inches across) it won’t fit on your hand – it will fit on your dad’s hand though. Why do you think it has these colors and those marks on the wings that look like eyes? Do you know what those two things sticking out of the moth’s head are called? They are called antennae. If there is only one it is called an antenna. Most insects have antennae on their heads to help them feel where they are they going and tell them when to turn around or go another way. 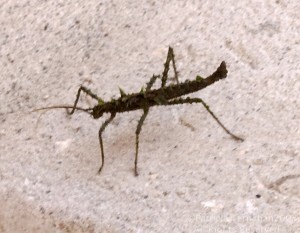 Sometimes when I bump into something, I wish I had antennae! If you click on the picture it will open a bigger image in a new window and it will be easier to see the antennae). Happy Birthday Again, Nathaniel !! 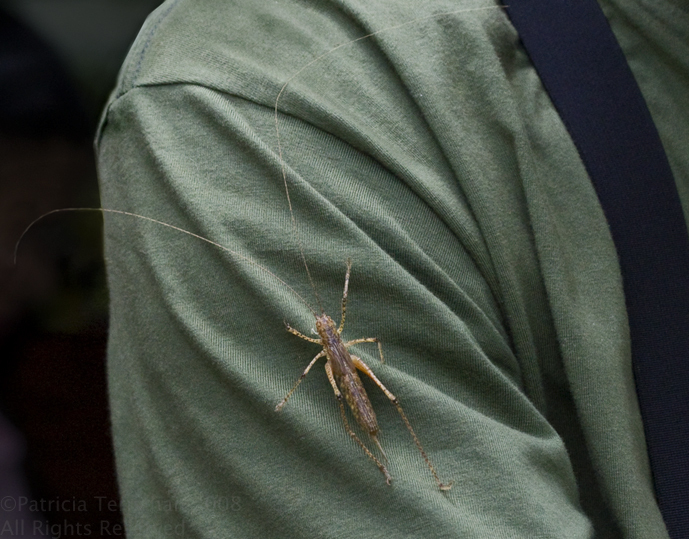 Here are two “walking stick” bugs – do you remember when we talked about them? 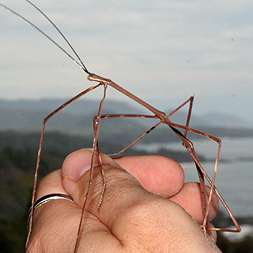 Why do you think they are called walking sticks? Do they look exactly alike? If you think they look different, what are the things you see that are not the same? Why do you think they look different? I had a lot of fun yesterday while you were here. You are such a good jumper, I’ve decided to send a jumping bug today. This insect is called a long horned grasshopper. These insects aren’t really grasshoppers, but are more closely related to crickets and katydids. They eat mostly leaves, but some kinds of crickets eat other bugs too.. The male(boy) crickets of this family make a lot of noise to attract the females (girls) by rubbing a special part of their wings called a “stridulating organ” against their bodies. Have you heard crickets singing at night? Did you know that the warmer it is outside, the faster they chirp? Can you guess where the ears are? The ears are on the front legs – what a funny place to have ears! You can tell this is a female(girl) grasshopper(cricket) by the small pointed thing that looks almost like a tail or a stinger. It is called an oviduct and is used by the females to lay eggs. Do you think they really have horns? If they aren’t really horns, can you think of what those two long (longer than the cricket’s body!) thin whisker like things are coming from the head might really be called? There are about 255 different family types (called species) of these crickets in the United States. In the world there over 6000 different species – that is quite a lot, don’t you think? I took this picture in Ecuador in South America. 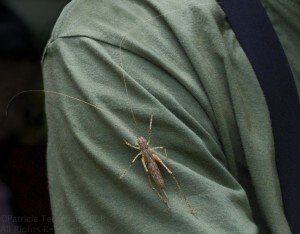 In Japan many people think crickets are lucky and they try to take very good care of them. 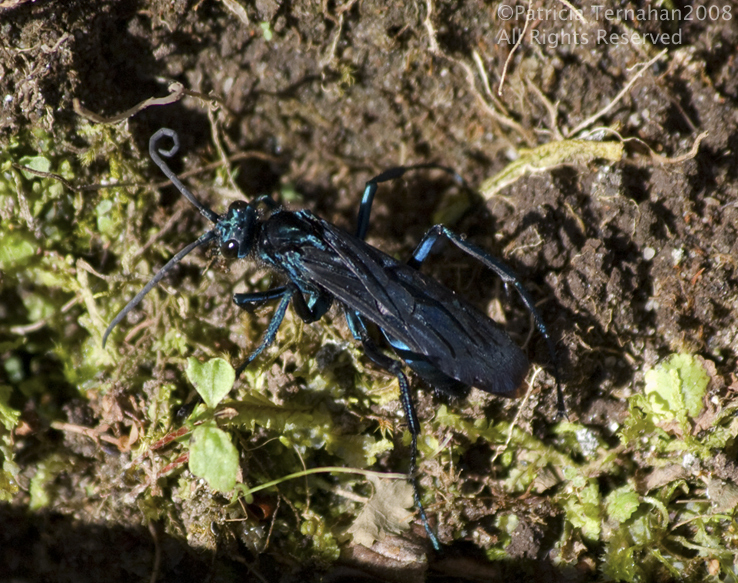 Here is a type of digger wasp called a spider wasp. This one is a beautiful color of blue, but there are many different types of digger wasps and they can be very different colors. Spider wasps build nests by digging in the ground or in a rotten log. 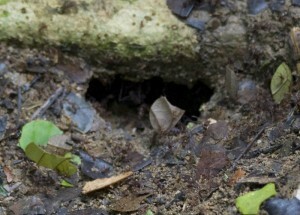 If you look carefully, you can see a hole in the dirt in this picture – that is the wasp’s nest. What do you notice about the wasps’ eyes? Do they look like your eyes? These very big eyes are called compound eyes – they are actually made of hundreds or thousands of tiny eyes. 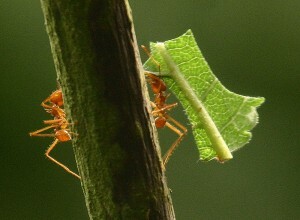 Look carefully at the antennae – see how one is curled and one is straight? If you look very carefully, you cans see little lines on the antennae spaced evenly apart – these are called segmented joints (segment means a part of something and joint is where two parts are attached). These segments are special because they allow the antennae to bend – it works like your elbow and knees and fingers. 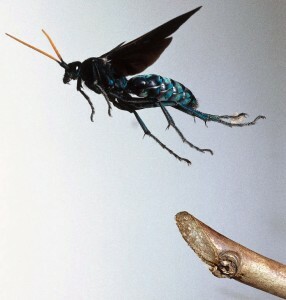 Why do you think the wasp needs to bend its antennae sometimes? 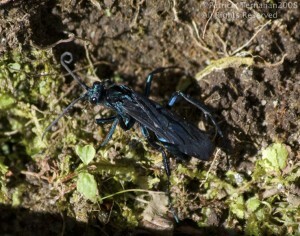 Here is another spider wasp. This one is flying and you can see how long its legs are. Here is the fifth and last of your birthday bugs! There are so many interesting insects and so many interesting facts about the things they do that is hard to choose which one to talk about. But if you like these letters, (I like writing them!) we can keep adding bugs and learning about them as long as you like. 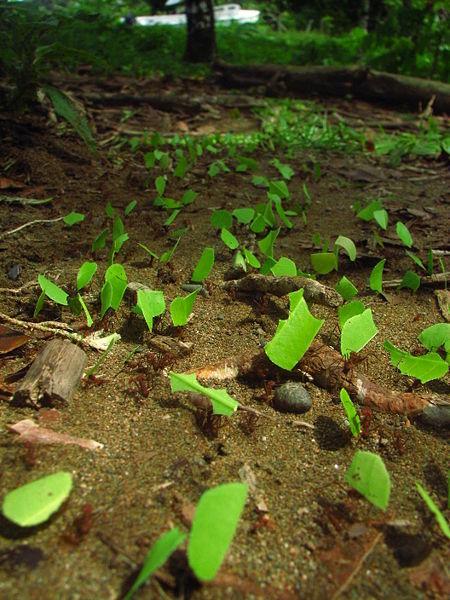 Today’s bug is actually a LOT of bugs – in fact in one colony (a colony is like a town in many ways) of Leaf Cutter Ants there can be as many as 8 million ants. How big do you think that a colony might be? 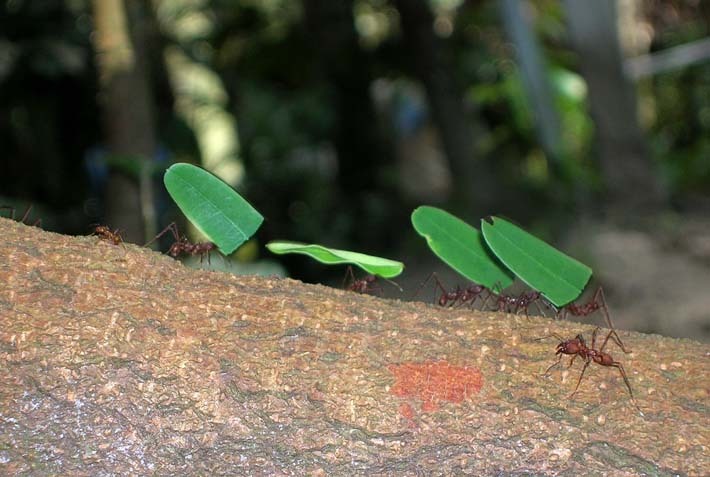 One colony of leaf cutter ants might cover 800-1200 square feet - that is bigger than your front and back yards put together. These ants are farmers and like any farm, everyone has an important job to do. There is only one queen ant, she is the biggest ant of all. Her job is to lay eggs. There are many, many worker ants. 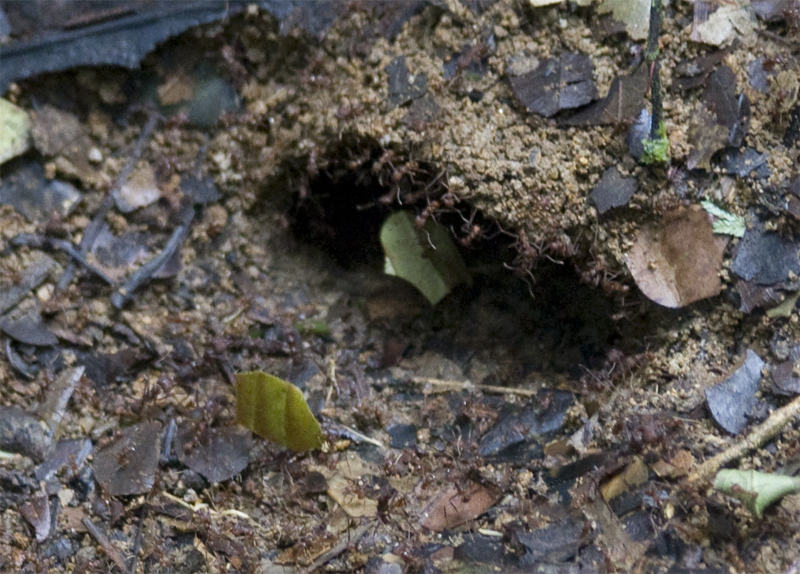 Some workers keep the nest clean and neat and take care of the baby ants. These are the smallest ants(called Minims). Minims are like farmers – they raise a special kind of fungus for the ants to eat – this fungus only grows underground in the ant colony. 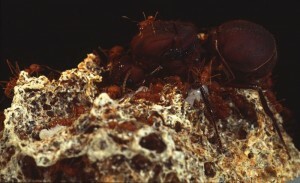 In order for the fungus to grow, the ants have to feed it. The fungus needs freshly cut plant material, like leaves in order to grow. Once the leaves are brought back to the colony they must be chewed into a pulp before the fungus can grow. Do you see the light green area on the top left side of the picture? 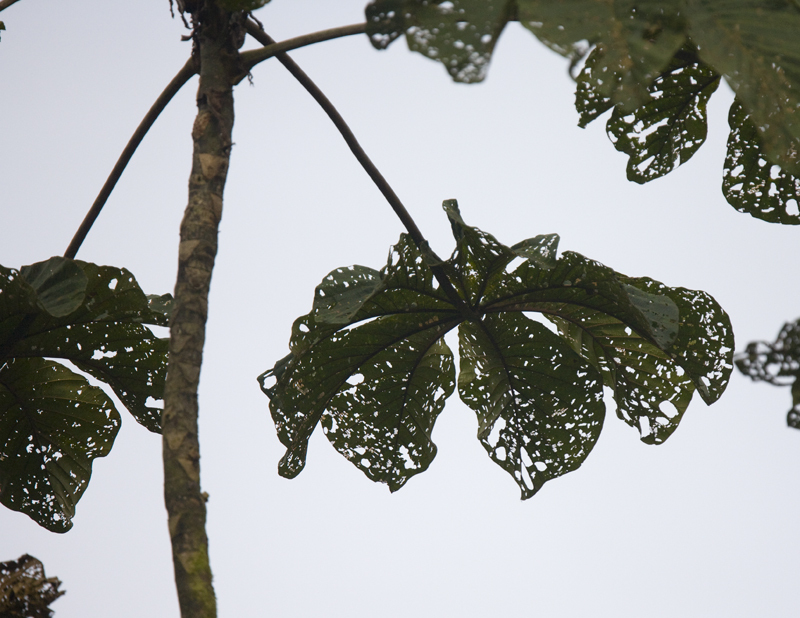 That is an area of chewed leaves or pulp that the ants will take inside the colony to make a garden to grow some fungus to eat. Another group of ants has the job of climbing trees and cutting parts of leaves and carrying them back to the ant colony. In fact there are two types of ants to do this job – the medium sized ants (called Mediae) do the cutting and carrying. They are very strong! The leaves they carry can weigh up to 10 times more than the ant. That would be like you carrying both your mom and your dad over your head! These ants have very long legs because they do a lot of walking! Another group of ants that is smaller then the Mediaes but bigger than the Minims are called Minors. Some of the Minors actually ride on the heads of the Mediae to protect them from any attackers while they carry the leaves. Can you find some Minor ants getting a ride in that last picture? 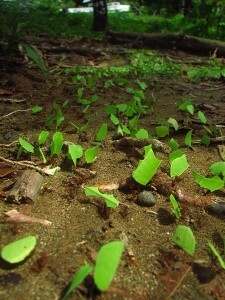 The ants have special glands on their bodies that leave a smell on the ground so they can follow that scent to get home. Did you know ants could smell? After their hard work finding the leaves, cutting the leaves and carrying them back to the nest, the biggest soldier ants called Majors are there guarding the entrance to the nest. 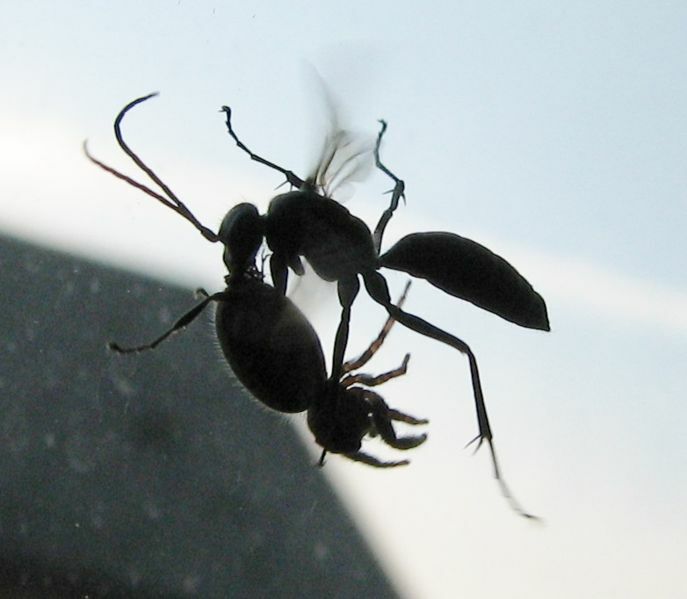 These big, fierce ants attack any ant from a different colony or any thing else that tries to get into their colony – like other animals that might want to eat ants. They might even attack curious people that disturb the colony. These soldiers have very big jaws and can bite REALLY hard! Can you find the big fierce ants guarding the entrance to the colony? Oh, My! What do you think has happened to these leaves? It is something really special to be hiking through the jungle forest and see hundreds and hundreds of bright green pieces of leaves marching across the forest floor! I hope you will get to see it someday! It is a beetle on the head of a pin. It is so small, you could barely see it without a microscope. This picture magnifies the beetle 40 times. 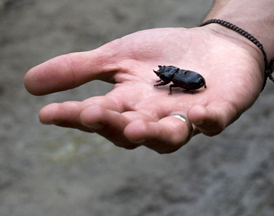 The beetle is really about 5 millimeters long – that is about as big as the period at the end of this sentence. Isn’t it amazing that something so tiny can be so beautiful? I saw some really interesting things today at the California Academy of Science in San Franciso. I can’t wait to take you there! I saw a fishing spider – it sits on a leaf on the pond with its legs in the water. When it feels the water move, it knows there is breakfast or lunch or dinner (a tiny fish) swimming by and the spider gobbles it up. that look like just like twisted vines – until they stick out their tongues! And there are many beautiful fish and frogs and penguins and dinosaur bones and lots of things I didn’t have time to see. I hope we can go there together very soon! I just found some really beautiful pictures of bugs. Hope you like them too. These are all insects that trout (fish) like to eat. I hope you and I can take some pictures like this soon. It was fun to see you today -as always! I’m sorry the Bone Room wasn’t open, but we will go next week! Here is a Rhinocerus Beetle. Is it exactly like the picture in your magazine? Count the legs, compare the antennae and the markings on the body and the rhinocerous “horns” on the beetle’s head. It was fun to see you on stage singing and dancing tonight! This mammal is probably the biggest animal that has EVER lived on earth. It lives in the ocean and it eats some of the smallest animals on earth – tiny little shrimp. It must have to eat millions of shrimp to get so big! A baby weighs 6000 pounds when it is born. That is as a big as a full grown hippopotamus! The babies drink about 400 gallons of their mother’s milk every day – and they gain about 200 pounds every day – that is not much more than your daddy weighs. And can you see the person next to the picture of this giant here? I hope we can see a blue whale together someday! Today I learned about the Yellow Flower Spider. It hides on yellow flowers and waits for something good to eat to come along – like a bee. (Would you like to eat a bee?) This spider is also called the Yellow Crab Spider because it looks like a crab. The insects it catches are usually bigger than the spider! It is a very pretty little spider – but hard to see on a yellow flower.